Marlisa Punzalan has made it to The X Factor Australia 2014 Final 3 – she will compete in the Grand Finals next week! The 15-year-old Filipino descent singer is through to the Grand Finale of The X Factor Australia competition. The great news was announced at the end of the Live Decider episode on Monday, October 13, 2014. But before securing the spot, Marlisa Punzalan faced Regan Derry in the sing-off round after falling in the Bottom Two. 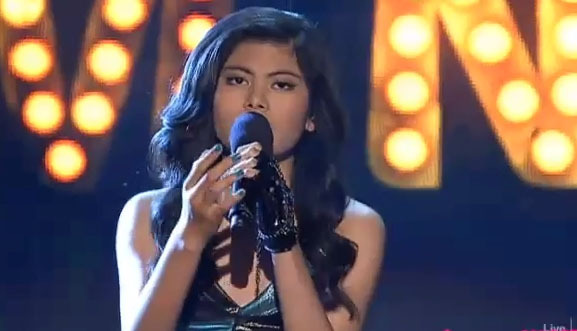 In the sing-off, Reigan performed “Hallelujah” by Jeff Buckley while Marlisa sings ‘Help’ by The Beatles. The judges’ deliberation resulted in Deadlock and the final verdict is up to the public. Reigan Derry received the lowest number of votes from the viewers and Marlisa Punzalan avoids the elimination. Joining Marlisa Punzalan in the Final 3 are Brothers 3 and Dean Ray. Congratulations!